Poojary says he is waiting for party ’notice’ ! 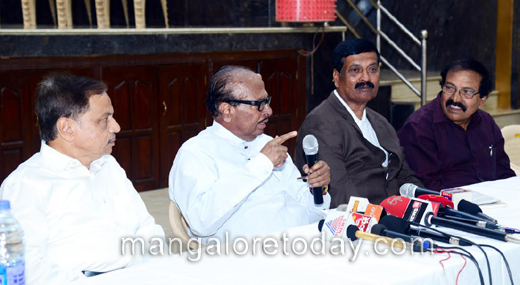 Mangaluru, Feb 18,2017 : Senior Congress leader B Janardhana Poojary seems to be unperturbed over the recent reports that the high command has recommended disciplinary action against him. Addressing a press meet here on February 18, Saturday, Poojary said he was waiting for a Congress notice and added he would be happy to receive it. At the same time he declared that he would not leave the Congress party as it is in his blood. Reiterating that he always spoke the truth, Poojary questioned if he was not supposed to advise Chief Minister Siddaramaiah. On this occasion, Poojary tendered an apology to family of the deceased Prajavani reporter Chethanram Iranthakaje for announcing a monthly aid of Rs 50,000 on his behalf. Poojary said he declared so without thinking about it and said he was unable to pay such a huge sum monthly and handed over a cheque for Rs 50,000 as his one-time assistance to the family of the deceased journalist. Prajavani reporter Mahesh received the cheque on behalf of Chethanram’s family. On this occasion, Poojary informed that the Pushkarini or the lake of Kudroli Shree Gokarnanatheshwara Temple, along with the garden nearby will be named after industrialist J P Narayana Swamy who passed away recently in Bengaluru. Poojary also recalled the contributions made by Narayana Swamy towards the renovation of the shrine. We have to respect Mr Poojary’s age that’s it . Because he many times test the patience of the public.